MORE UP A TREE represents the first collaboration between legendary drummer Jim White, installation/film artist Eve Sussman, and acclaimed performer Claudia Serpa Sorres. Hal Wilner Projects and was a founding member of the Australian punk band Venom P Stinger. Most recently he has formed Xylouris White, discovered the Double and along w Eve and Claudia created More Up a Tree. the Opera de Dijon and Jochen Sandig in Human Requiem with the Rundfunkchor Berlin. Claudia has been working with the Rufus Corporation in New York and choreographed several video art projects and movies with Eve Sussman. She has created and performed Crossroads with Ronald Kukulies, Edgar with Grayson Millwood, The Circuit a solo performance and More Up a Tree with Jim White and Eve Sussman. Art. Sussman has received support from the Guggenheim Foundation, Creative Capital, NYSCA, NYFA and Hauptstadtkulturfonds-Berlin among others. She has work in collections that include the Museum of Modern Art and Whitney Museum in New York; and the Smithsonian in Washington D.C. 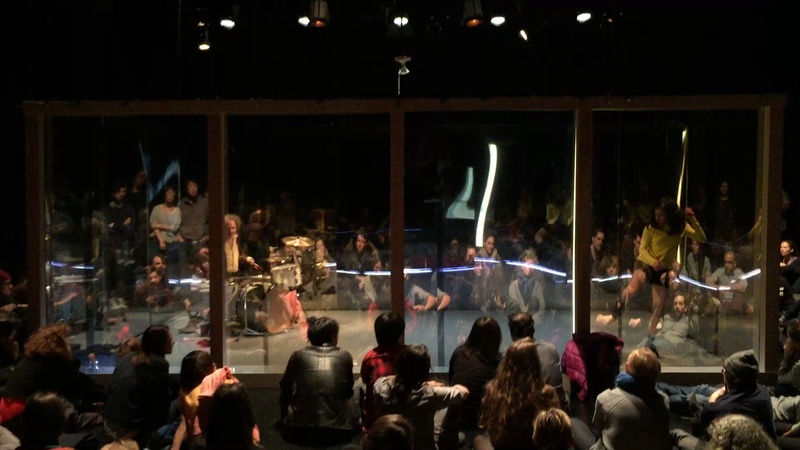 Together with Simon Lee, Sussman co-founded the “Wallabout Oyster Theatre” a micro theatre space run out of their studios in Brooklyn. 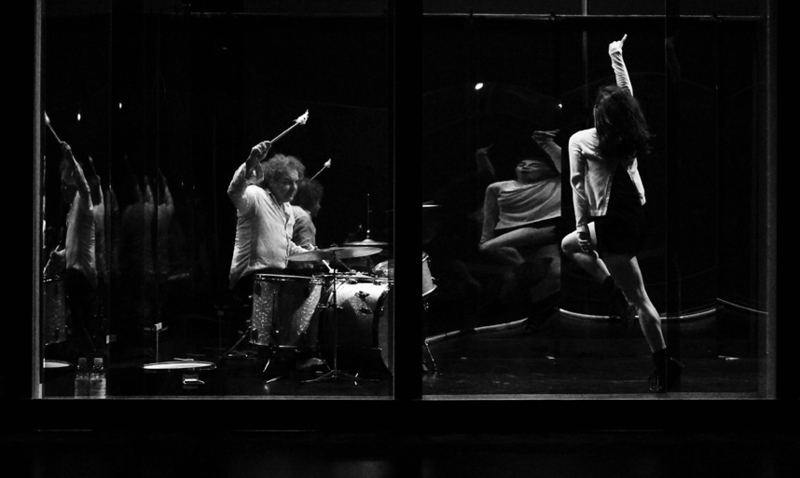 Sussman and Lee most recently completed a residency at the EMPAC where they shot a new piece No Food, No Money, No Jewels, now in post-production that will premiere in February 2016. They are also producing for Jack+Leigh Ruby, two reformed criminals, now artists. Most recently Sussman has joined de Serpa Soares and White to make More Up a Tree. More Up a Tree is a performance by legendary drummer Jim White, dancer Claudia de Serpa Sorres and acclaimed artist Eve Sussman that takes an instinctive approach to musical flow, free from conventional narrative and melody. Emotional reaction to music is so commonplace that it is easy to forget the phenomenon is extraordinary. It is as mysterious as gravity. 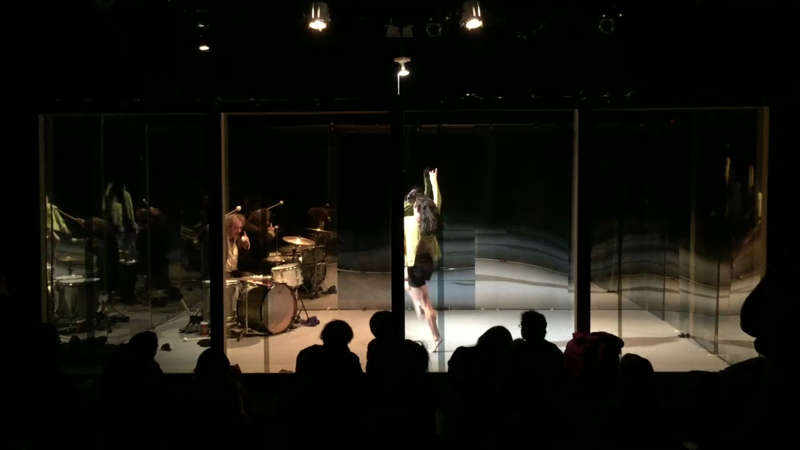 The piece takes place in a mirrored box with windows made with mirrored Plexiglas. 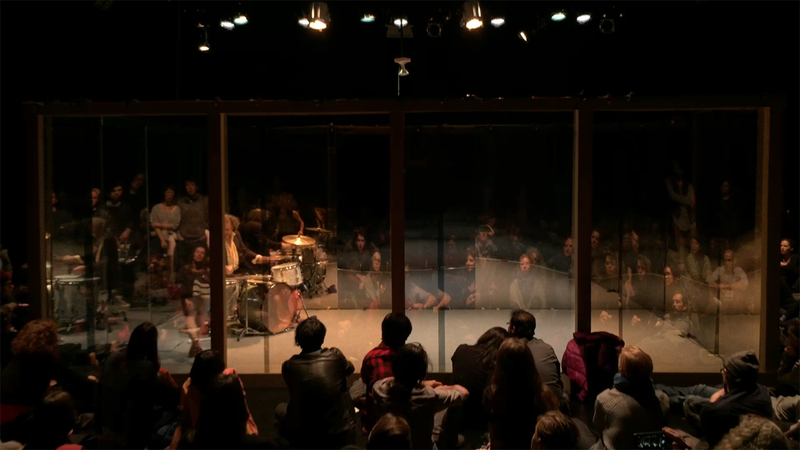 When the show begins, the audience sees inside but the dancer and the drummer cannot see out. 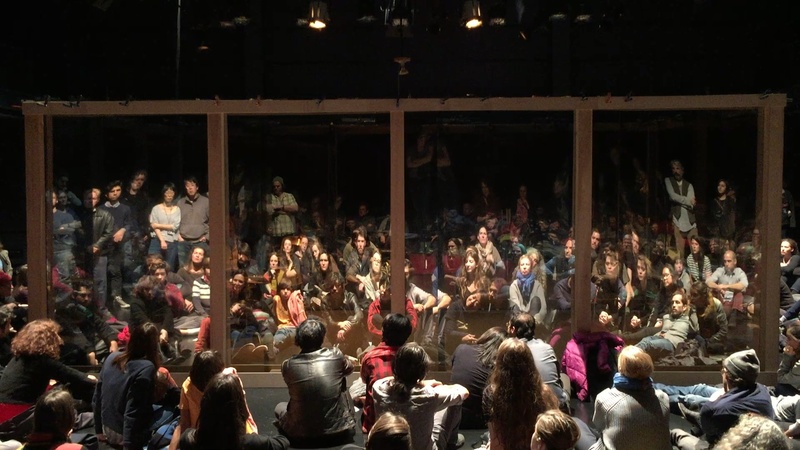 At times the audience sees themselves reflected and cannot see inside the box. The performers are alone, in public. Their unusual sense of privacy on stage changes their demeanor while the audience has an ordained voyeurism, transcending the usual performer-viewer relationship. By doing away with narrative and melody, and making a constantly “in flux” relationship to the public, attention is focused on the agency of the drumming and dancing and the audience. In More Up a Tree, we reveal the meaningful nature of movement by removing tonality and concentrating action inside a box.